Invertebrate Laboratory Equipment There are 25 products. The spatula end of this useful tool can be used for scraping smooth surfaces such as the plates on a Hester-Dendy sampler or the slides on a periphyton sampler. This spatula is also useful for applications that are mixed in nature. 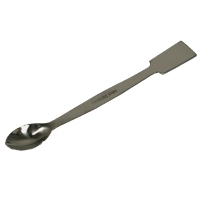 The spatula is 150 mm (6") long and is made of stainless steel. 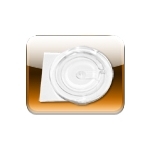 Petri Dish,Gridded Sqrs. Pk/10. 7 X 3.5 X 3.5". 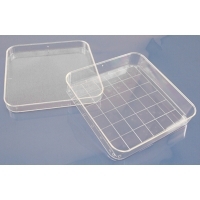 This disposable, sterile, polystyrene dish consists of 36 small squares. Each square is identified both vertically and horizontally to facilitate the counting and locating of specimens. Both the top and bottom are packaged in sterile materials. Size is 100 square millimeters by 15 millimeters deep. 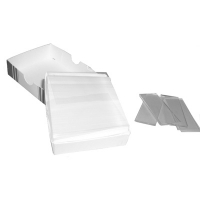 Microscope Cover Slips Square 22 x 22mm, pack of 100, Glass. Cover Slips The plain glass surface is free from irregularities. 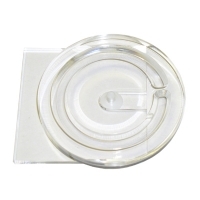 In boxes of 100.Small cover slips: 22mm x 22mm with thickness 0.13 to 0.17mm (.005 to .002). 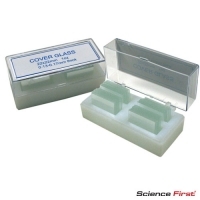 Microscope Slides These clear glass slides with ground edges are 25 mm x 75mm approximately 1mm thick (1” x 3” x 0.05”). 72 per box. Ward Zooplankton Counting. Wheel Acrylic. 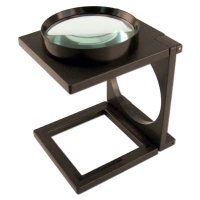 This magnifier has a 10 cm lens on a foldable stand. It can be placed on top of a book or a map to make reading small details easier.